Some pictures from sidekick#3, deployed in March of 2018. You can see huge clumps of ice algae, these grow attached to the underside of the ice and then fall off as the ice melts and sink to the seabed. This is a video of the daily surface pictures from WARM deployment site six. The buoy was deployed in March of 2017 and the ice melted out in August. 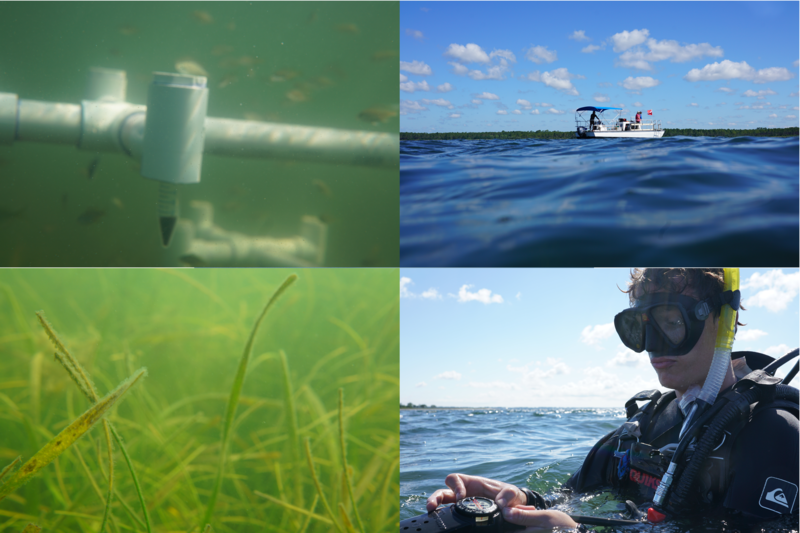 Scientists from ODU and WHOI are at the Florida State University Coastal Marine Laboratory this summer to study the role of seagrasses in sequestering carbon in the shallow waters of the Gulf of Mexico. The team led by Drs. Zimmerman and Burdige of ODU, and Dr. Matt Long from Woods Hole Oceanographic Institution, are utilizing cutting-edge methods for measuring photosynthetic oxygen and carbon exchange (Eulerian and eddy covariance techniques) combined with sediment geochemistry measurements to build and test numerical models that can be scaled up to quantify the dynamics of carbon flux in seagrass meadows. Photos. Upper Left: Sediment traps collect samples for analysis of carbon deposition rates in seagrass meadows. Upper Right: Our 28’ research vessel on station in St. George Sound, Fl. Lower Left: A dense meadow of seagrass Syringodium filiforme at one of our stations. Lower right: Graduate student Brian Collister preparing to collect seagrass and sediment samples using SCUBA.